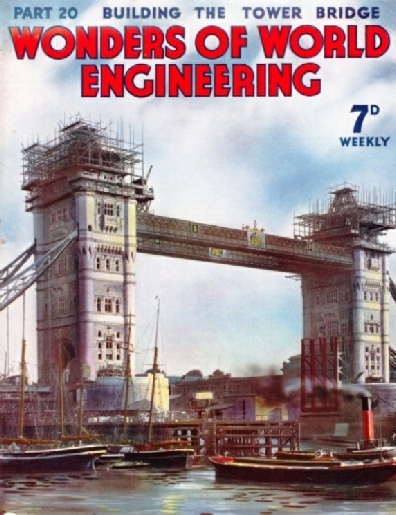 Part 20 of Wonders of World Engineering was published on Tuesday 13th July 1937, price 7d. 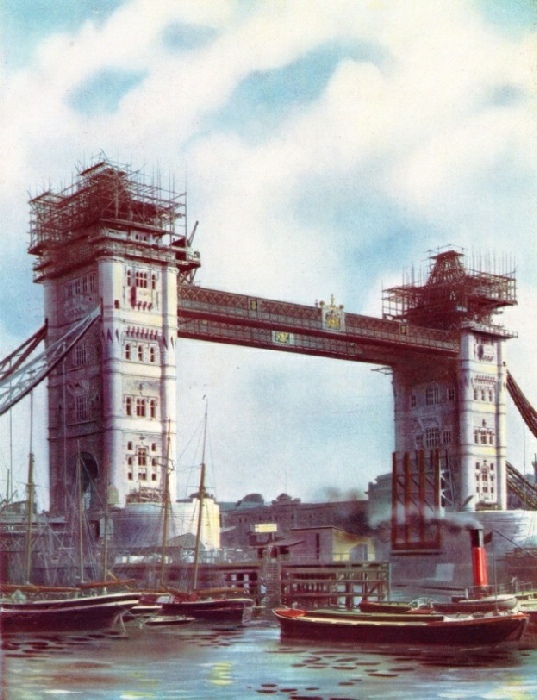 Part 20 includes a colour plate showing Tower Bridge under Construction. 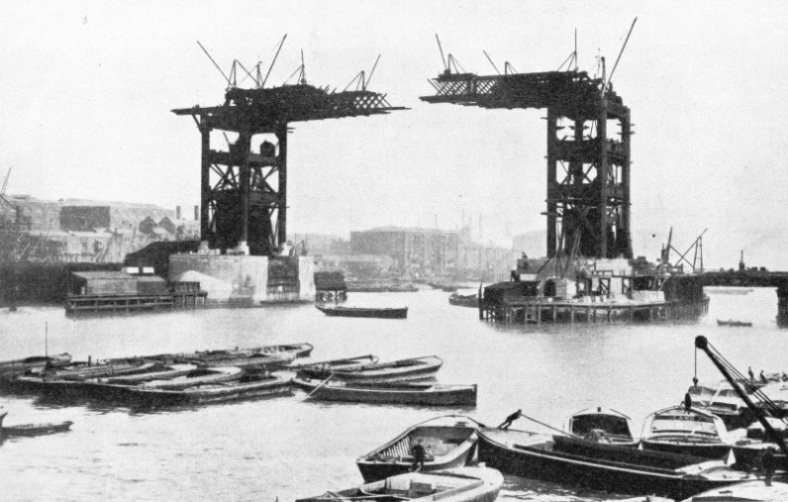 It formed part of the article on Building the Tower Bridge. The colour plate was also used as the cover design for this part. The cover design was also used for the colour plate in this issue. The construction of the canal which links the River Volga with the Moskva River. This chapter is by Sidney Howard and is concluded from part 19. 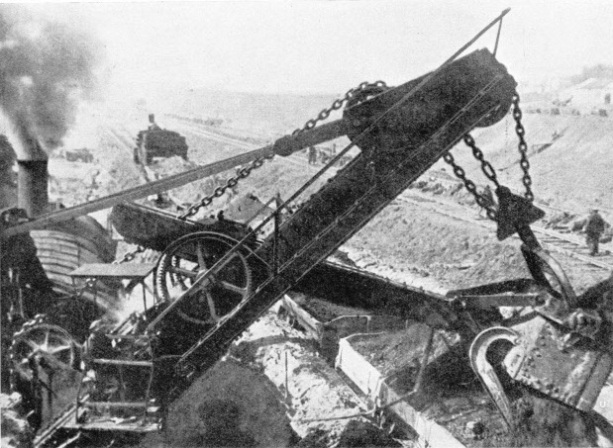 EXCAVATION by a steam shovel on the Moskva-Volga Canal. In all 201,900,000 cubic yards of earth were removed by 147 stem shovels and other means. The most famous example of the bascule bridge is the Tower Bridge across the River Thames in the heart of London. Engineers were able to build this type of bridge without interrupting traffic on the great commercial waterway. This bridge is one of the most distinctive bridges in London, if not the world, and its construction was a fine achievement. This chapter is by Harold Shepstone and is the seventh article in the series on Linking the World’s Highways. The building of the tunnel beneath the River Severn is one of the epics of engineering. For nearly fourteen years men worked on an underwater short cut between England and South Wales, waging a perpetual battle against inundation. Stories of heroism in the course of great engineering tasks are frequent, but there are few stories so moving as that of Diver Lambert who, again and again, entered the flooded workings of the Severn Tunnel. The building of the Severn Tunnel is an epic in itself, but the story of Lambert is a record of amazing courage. The chapter is concluded in part 21 and is the fifth article in the series Below the Surface. 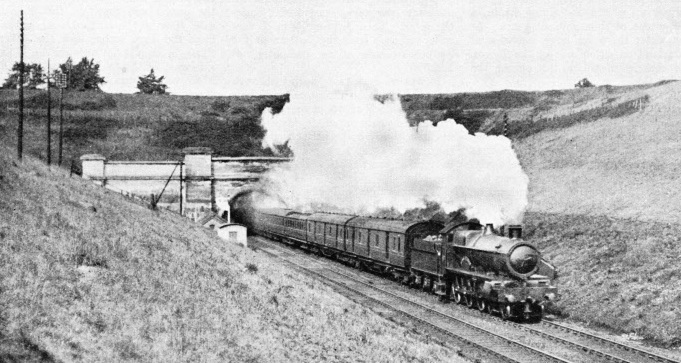 You can read more on the Severn Tunnel in Railway Wonders of the World, and in Frederick Talbot’s Railway Wonders of the World (1913). 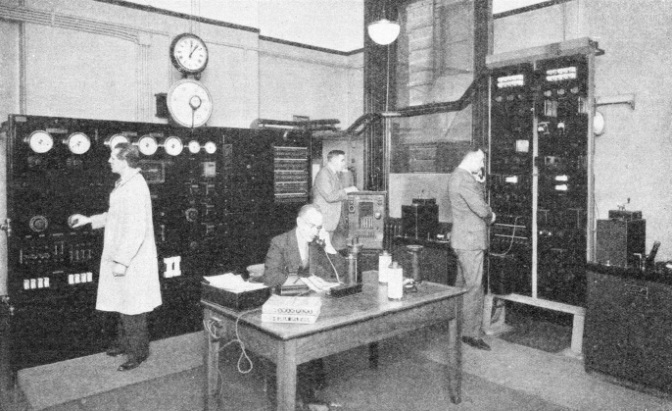 THE PICTURE TRANSMISSION ROOM at the Central Telegraph Office, London. On the left is the power switchboard, and on the right the control panel for the transmitter and the receiver. The small black cabinet to the left of the control panel is the transmitter, and that on the right of the control panel is the receiver. Nearly 400,000 people live on the island of Hong Kong, where the natural water is insufficient for their needs. 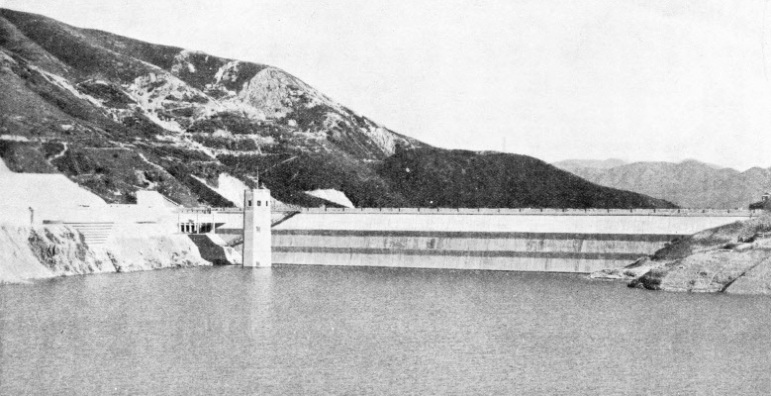 On the mainland of Kowloon were built a large dam and reservoir to store an adequate supply, which is carried across to the island in a main. In modern cities the water supply is one of the essentials of life, and in many parts of the world it is difficult to ensure a sufficient natural supply of water. In Hong Kong, for instance, the more important part of which is an island, although there are periodical torrential rains, the natural water supply is insufficient for the 400,000 inhabitants. How the problem was solved is described in this chapter. THE SHING MUN DAM was built across a gorge in the valley of the Shing Mun River, in Kowloon, to create a large reservoir to supply the island of Hong Kong with water. The dam is 275 feet high and its summit is 635 feet above sea level. The upstream face is here illustrated. ENTRANCE TO THE SEVERN TUNNEL, on the Gloucestershire side of the river. The tunnel has a length of more than four miles, of which about two and a quarter are beneath the estuary of the River Severn. Some of the finest achievements in the field of electrical engineering are incorporated in the picture telegraphy service which is in regular operation between London and the principal European countries. The newspapers are often using photographs of an event which has taken place only a few hours before on the other side of the world. This is made possible by a form of picture telegraphy in which the picture is “translated” into signals which may be sent over a wire or through the ether and “retranslated” into a replica of the original. The General Post Office uses what is known as the Siemens-Karolus system, and a regular service was inaugurated in 1930. In this chapter Howard Barry describes how pictures can be transmitted by this system. Although steam had long been recognized as a potential source of power it was not until the seventeenth and eighteenth centuries that such men as Savery, Newcomen and Watt evolved the principles of the engines now in universal use. Internal combustion engines, such as diesel engines, are becoming increasingly important as motive forces for many forms of transport, but there is little doubt that these newly developed forms of power will never entirely supersede steam. The story of the origin of the steam engine is told by C Hamilton Ellis. 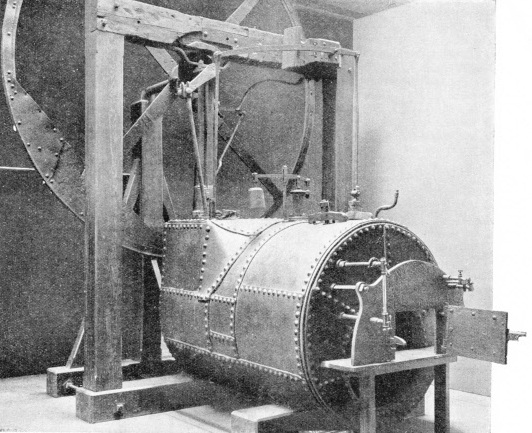 HIGH-PRESSURE ENGINE AND BOILER made by Richard Trevithick in 1811. This is said to have been the first steam engine to drive a threshing machine. The boiler is 7 feet long and has a diameter of 4 ft 6 in. The long connecting rod, attached directly to the piston, passes up to a crank on the shaft of the 10 feet flywheel. The cylinder has a diameter of 9½ in and a stroke of 26 in. THE TOWER BRIDGE across the River Thames, in the heart of London, is one of the most famous examples of the bascule type of bridge. The bridge is built of steel, a fact disguised by the facing of masonry over the completed structure. Work was started in 1886 and the bridge was opened in 1894, having cost about £1,000,000. At high water the footways at the top of the bridge are 140 feet above the river. The central opening span is 200 feet long and each of the fixed suspension spans at the landward ends is 270 feet long. GAUNT STEELWORK forms the towers that rise from the enormous piers of the Tower Bridge. Each of the towers is formed of four octagonal columns with a diameter of 5 ft 6 in. At a height of 60 feet above the piers is the first landing, with another landing 28 feet higher. Twenty-eight feet above this is the third landing, leading to the high-level footways. 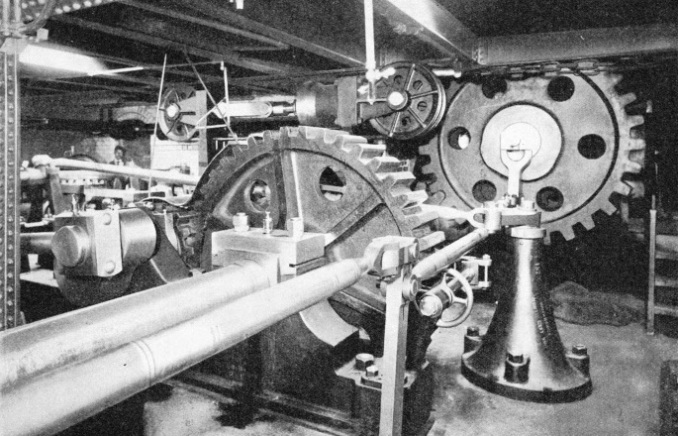 HYDRAULIC MACHINERY operates the bascules of the Tower bridge. The source of power is a building on the south bank of the river, where two large accumulators store water to deliver to the hydraulic machinery at a pressure of from 700 lb to 800 lb a square inch. THE CONTROL PANEL (right) contains a large amount of intricate apparatus, some of which is common to the transmitter and the receiver. The tuning fork for the synchronizing apparatus and its valve amplifier are housed behind this board. The engineer in the illustration is speaking to the distant operator before beginning a transmission. 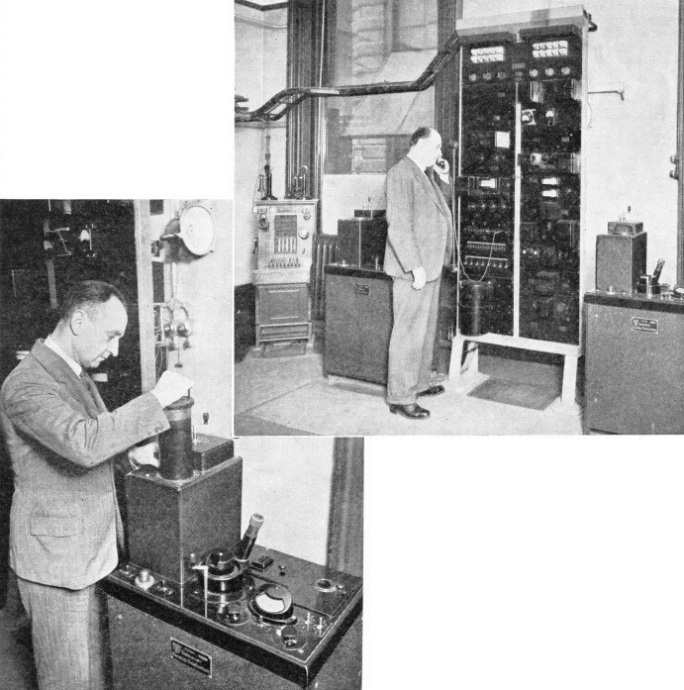 THE RECEIVER MACHINE (left). The operator is removing a negative, completely enclosed in its light-proof case, before taking it to the dark room for developing and printing. In the centre of the machine, above the name-plate, is the disk which indicates synchronism between the receiver and the transmitter. 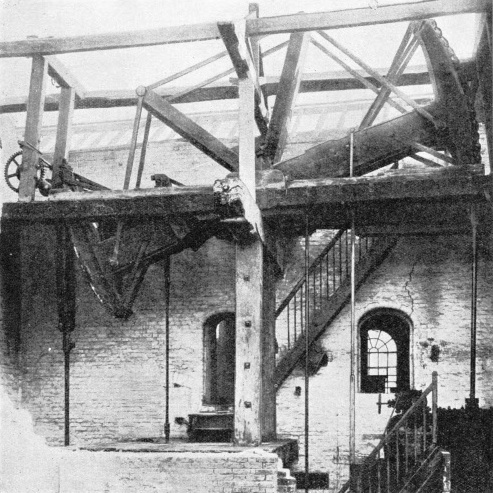 EARLY STEAM ENGINE built by Boulton and Watt in 1777 for a pumping station connected with the Birmingham Canal Navigations. The engine is single-acting, the cylinder having a diameter of 32 in and a stroke of 8 feet. It was in regular use until 1892 and was worked occasionally until 1898, when it was removed and preserved. 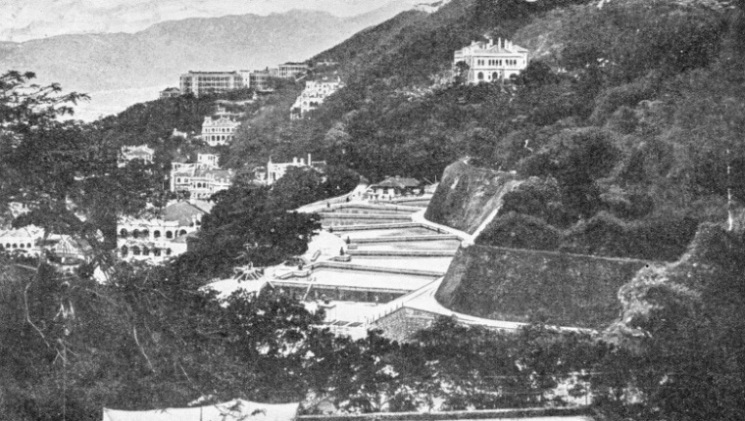 FILTER BEDS at Bowen Road, Hong Kong. The natural resources of the island on which stands the port of Victoria had been tapped by a series of catchments and channels, but the supply was inadequate for the growing population. Water is now supplied from the reservoir on the mainland. The reservoir is fed by the Shing Mun River. supplied by the oil engine immediately behind it. “cranked up”, and in this instance the engine is coupled, on the side away from the alternator, to a motor which is driven by direct current of 60 volts from a 30-cell storage battery. 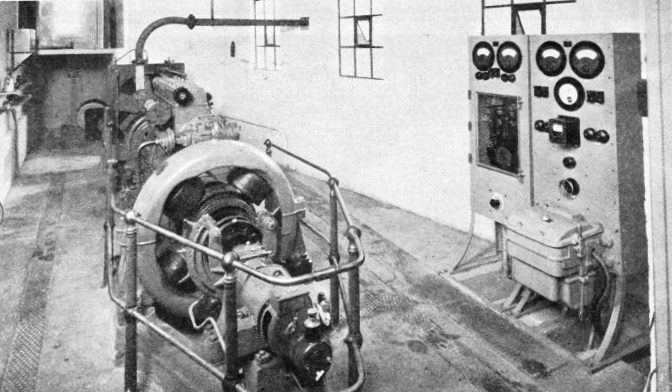 The two panels at the right-hand side of the engine-room effect the automatic control of the set. One of them has starting and stopping push-buttons, and there is a similar pair of buttons for the signalling current in the main transformer station, in which station there is always an operator on duty. Should a current failure take place it is immediately detected by the operator, who actuates the starting push button of the emergency set in the station. On this action electric devices in the panels complete the storage battery circuit, and the starting motor turns the engine, the fuel valves of which are automatically opened at the same time. The engine then begins to “fire”' and quickly reaches its full speed. After this has happened the automatic devices change the winding connexions of the motor, so that it becomes a dynamo and begins to charge the battery, replacing the current that has been used in starting. On the battery becoming fully charged another automatic change is made and the dynamo output is reduced to a “trickle”. than thirty seconds, the engine is automatically stopped. This is the eleventh article in the series on Modern Engineering Practice. 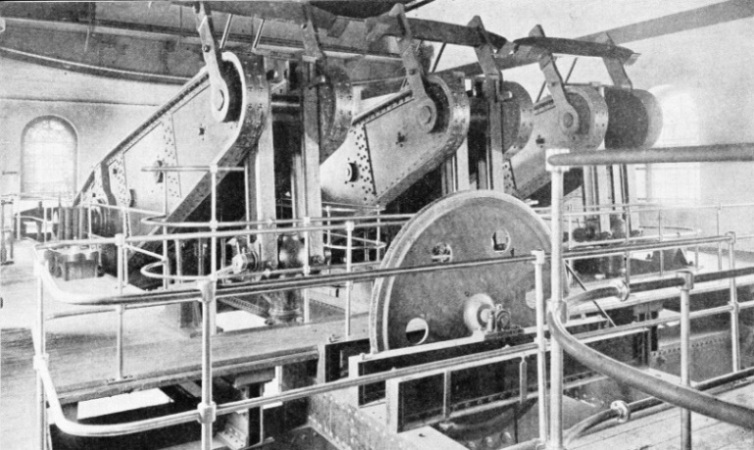 BEAM ENGINES operate six pumps in No. 1 Pumping House at Sudbrook. These pumps deal with the waters of the Big Spring. The engines have cylinders with a diameter of 70 in. And a stroke of 10 feet.